1. Pumpkin Cozy: I fell in love with this cozy the second I saw it and had to order one. How awesome for fall!? Plus, I love the idea of keeping this in my purse so I don’t need to get the starbucks sleeves – far more environmentally friendly! These cozies can only be ordered through the creator’s instagram account. Definitely worth a follow… and follow ME while you are at it! 2. Nasty Gal Blanket Scarf: The fashion world went NUTS last fall over Zara’s tartan blanket scarf… so much so that people were selling them on ebay for over $100.. 3x their original cost! That’s just ridiculous! Zara did bring their blanket scarf back again this year but, of course, they sold out online in less than 3 days. I found this one over at Nasty Gal which is a similar tartan pattern in a giant blanket size. To be honest, I love this one more! One of my fellow fashion bloggers, Tif at Bright on a Budget, told me about not one, but TWO different ‘zara-eque’ tartan (plaid) blanket scarves she found for UNDER $15!! 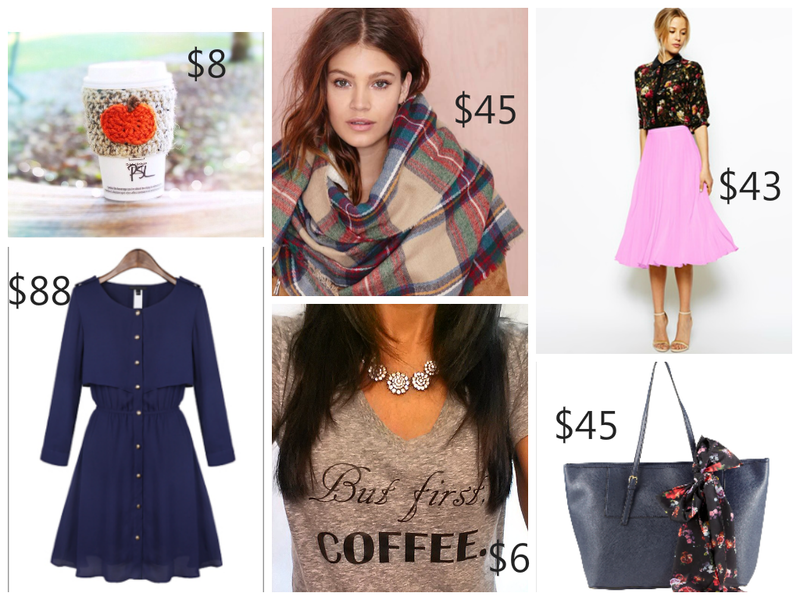 While she cannot vouch for the quality (she hasn’t received hers yet) I wanted to let all you readers know about these fantastic ‘finds for less’. First one here (I just ordered myself this one!) & Second one here. Thank you so much Tif for sharing these! <3 Check out Tif’s blog here. 3. ASOS Midi Skirt: I am loving all the dark hues of fall, but every once and a while I crave softer tones. This pale pink midi skirt is gorgeous and would look great paired with navy in the fall. 4. Goodnight Macaroon Dress: I love this navy chiffon dress for fall. It is the perfect lightweight material for early fall and would look great paired with riding boots and an infinity scarf. 5. But first, COFFEE (Decal): I am a coffee addict. The shirt you see is not for sale, rather, the iron-on decal is for sale through the designer’s etsy shop. You will see that it links you just to the ‘iron on black decal’… I have spoken with the designer who has said simply to leave the “But first, COFFEE” slogan in the information section so she knows what you want printed. I am excited to get this and iron it on my favourite cozy cotton tee! 6. Aldo Shoulder Bag: Can you tell I am really into navy at the moment!? I have always been a sucker for these affordable aldo bags with the attached scarf. I have had two of them over the past two years (different colours) and definitely want to add this one to my fall wardrobe. I realized the only fall purses I have are a black one and a cognac one, so I really need to amp up my purse selection! Thanks for the shout-out:) I will update on quality as soon as I receive the scarf, but I'm hoping for good things!!! No problem Tif! Can't wait to hear about the quality!